Full disclosure here, the author of AmiKit X supplied a review copy of the full AmiKit X package for review purposes to The Amiga Museum. AmiKit can be acquired for what is a very reasonable price from https://www.amikit.amiga.sk/ and is highly recommended. Do you remember when, instead of tiny, imperceptible, incremental improvements, a new computer got you huge leaps forward, with things taking much less time to achieve? Do you remember when computers were FUN? I personally see it as proof that the Amiga platform is still a viable choice for many computing tasks, it shows what can be done when building on what the Amiga team gave the world. In short, I strongly recommend it to anyone who has an interest in the Amiga, and I think the asking price is extremely reasonable, considering the amount of work that has gone into making this such a stable, fast and beautiful system, with plenty of software, from Games to Internet access applications pre-installed, with additional plug-ins available from: https://www.amikit.amiga.sk/store (scroll down the page). The machine I have installed it upon is nothing special, an aging AMD Phenom II X4 955 Black Edition CPU on a Gigabyte GA-970A-D3P, running at 3.6GHz, 8GB of DDR3 1600MHz RAM, a big, slow 3TB Western Digital Green SATA3 drive, and an AMD R9 270 Graphics card. This machine runs Windows 10, connects to the internet via an Australian NBN 100 FTTN connection, and gives an idea of how AmiKit X will run on a system that is based upon a nearly 10 year old CPU – your experience may vary, depending on your system specifications. I don’t know about you, but to me, that looks beautiful and left me with a great first impression. Even on such an aging system, the initial install process was extremely fast, taking only a few minutes. Once it was installed, it was time to configure it. 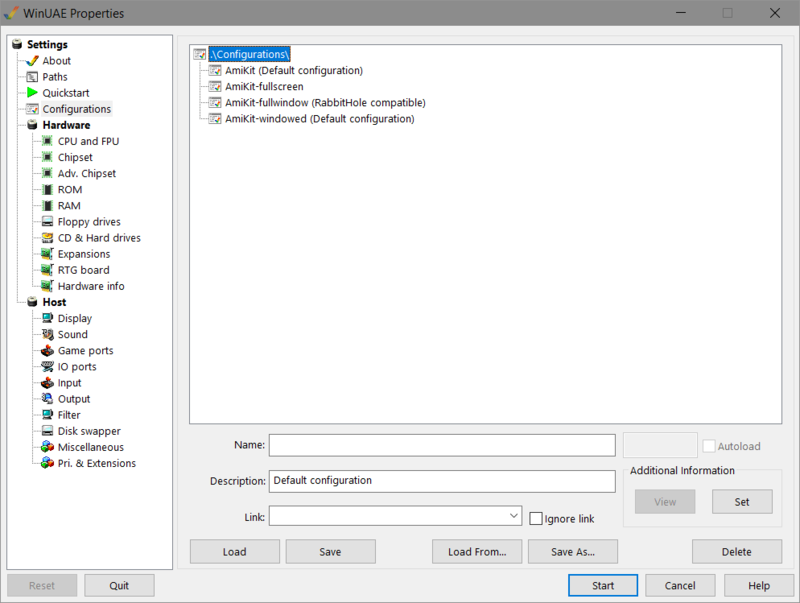 This is all made as easy as possible, with detailed instructions included with AmiKit X.
AmiKit X utilises WinUAE, but if you’re scared off by the many, many configuration options it has, don’t worry, you’ll rarely, if ever, need to change anything here. 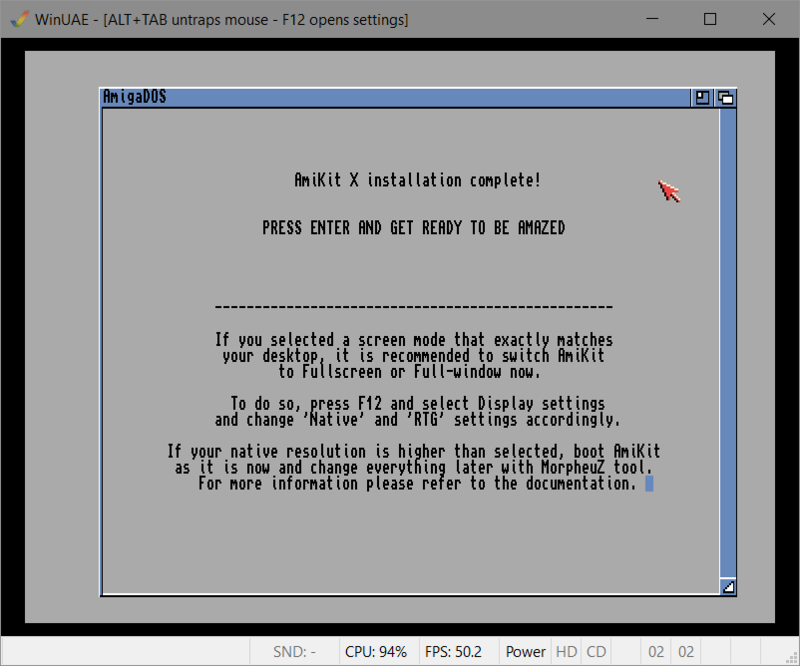 Before we can use AmiKit X, we need to finish the Amiga software side by providing a source of the Amiga Workbench files, which can’t be distributed with AmiKit X. Once again, this is all made as painless as possible, and a fair number of possible sources for these files are supported. Just follow the instructions given on screen and in the AmiKit X documentation, and in very little time at all, initial install and setup will be complete and you’ll be ready to see how AmiKit X provides you with a modern interface, a huge number of programs to use, and a lot of scope for changing the “look and feel” if the default screen resolution, colour choices and much more are not to your taste. 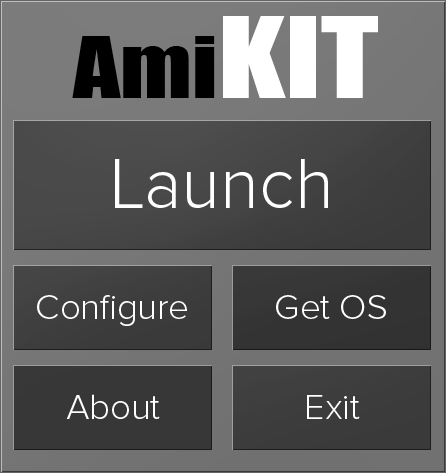 AmiKit X installation and configuration is now complete. This gives us our final look at the default look of Amiga Workbench 3 before we press Enter to reboot the emulated Amiga and start up AmiKit X for the first time. Only a matter of seconds later and Wow. Just Wow. Workbench looks so modern and beautiful with AmiKit X. 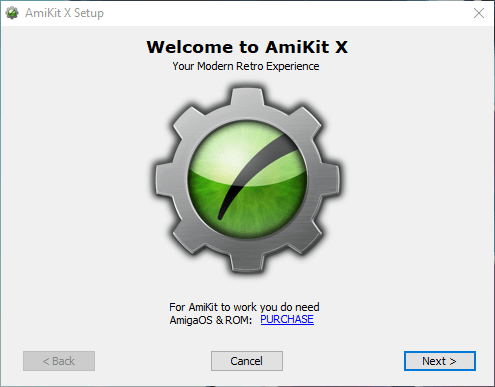 The first thing AmiKit X does now is to connect to the internet if available, so you can make sure all the Amiga software is up-to-date. Here it detected that there were updates, so I clicked the Download Now! button to get them. After a quick and painless process of downloading the updates, we are now free to explore what AmiKit X has to offer. To say I’m impressed would be an understatement. If you used an Amiga back in the day, you will love this. If you’ve never used an Amiga, you may very well be surprised at how fast everything is, and how much you can do that you may not have thought possible. This is well worth the small asking price in my humble opinion, to show how great the Amiga STILL IS. So, what can we do now? 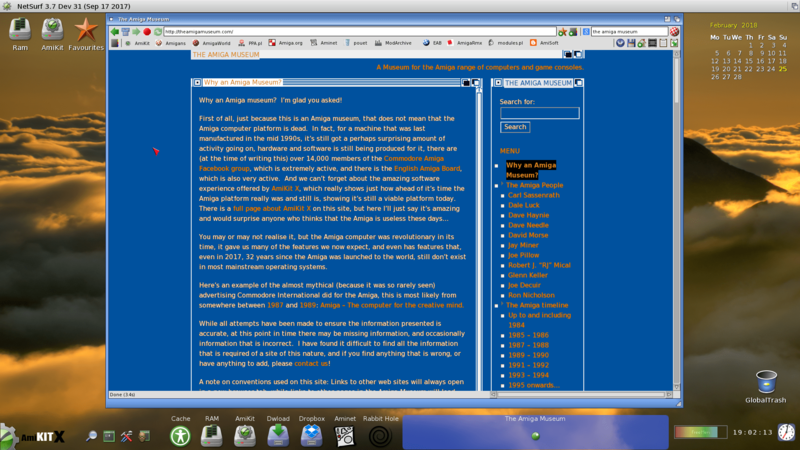 Well, lets start by changing the colour scheme, because while I love the default look, I must admit to preferring a more traditional blue for the active title bar of any window opened. But this is in no way telling you to do this, my intention is merely to show you how this can be done. From this point onwards, I have disabled the showing of my drives from my Windows host machine, to reduce the visual clutter. Things will no doubt look different on your own machine. We’ll use the MorpheuZ program to do this, which is the easiest way to change much of the look and feel of AmiKit X. 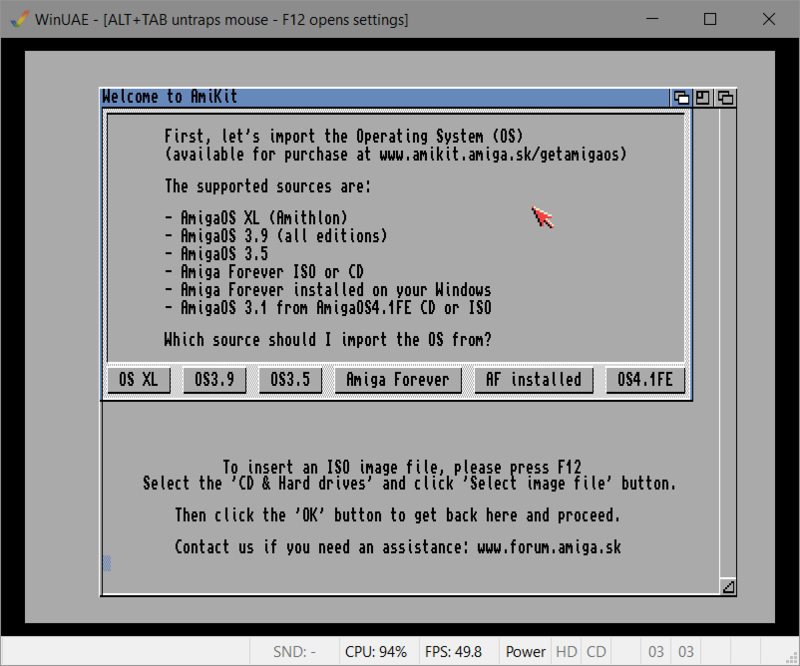 There are two ways of starting this, either we can utilise the “Windows 95” onwards menu, found in the bottom left of the screen, click on AmiKit X, click on AmiKit, then click on MorpheuZ. Or we can simply click on the icon for it at the bottom of the screen, to the left of the icon labelled Cache. 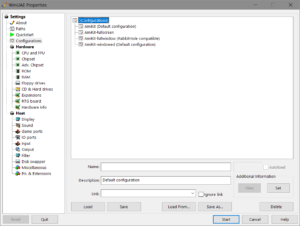 One thing to keep in mind is that most programs on AmiKit X, and tools such as MorpheuZ, are ready to use as soon as you’ve finished clicking on them. Your computer really will feel so much faster than you may have thought possible, as Amiga programs generally use far less memory and other resources, and take very little time at all to start. Also, in use, they generally “feel” lightning fast. This can be a stark contrast to what many of us are used to on ‘modern computers’. I made several changes using the MorpheuZ tool, and I was delighted with how easy this all was. Now, to get to the meat of what else we can do on AmiKit X. But there’s a good chance you’ve got a perfectly good web browser already that you’re viewing this on, so viewing web pages under AmiKit X may seem uninteresting to you. What else can AmiKit X bring to the table? Another feature that you may very well find useful is the “Rabbit Hole” feature, which allows you to start programs that work under Windows/Linux/OS X from within AmiKit X – so you don’t have to use NetSurf if you don’t want to, you can use Google Chrome, or FireFox, or whatever other browser you prefer. But this doesn’t only apply to browsers, you can use anything you have installed on your system, such as Steam, VLC media player, Skype or anything else. But wait, there is much, much more on offer here.